Ok, just got an update from a friend of mine who has been in contact with the CABRN. They have confirmed that Excelsior graduates who graduated after the cut off date can not only NOT apply for initial licensure, nor can they even apply for endorsement. They are flat out denying everybody because of the lack of clinical experience concurrent with theory. Even if you have worked as a RN in another state with sufficient experience, they wont even look at the application. But they will surely take your money just to deny you. For those of you who are lucky enough to live in a state that accepts the education, count your blessings as you are truely blessed to have Excelsior as an option. Unfortunately not all of us are lucky. Good Luck to all! I have a friend whose ultimate goal is to be a RN in cardiology. She has asked me a question that I really have no answer to. 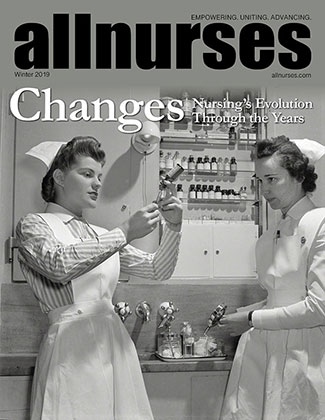 Since I can't seem to find the answer I'm turning to the allnurses.com readers/posters to see if they can help. She would like to do a EKG Tech course online. We have been searching but can't seem to find one. When we type in "EKG Technician online training" it brings up a bunch of stuff that has nothing to do with our search. Can anybody please help us? Do any of you know of any EKG Technician courses that are offered online? She doesn't have adequate transportation at the moment to attend a traditional classroom style. Any information is very helpful. Thanks in advance. For liability purposes in our hospital there's a differential only if you're a certified interpreter. If you're not certified then you wont get that extra pay. It can be in any language. This is all too weird as when I went to LVN school we were told that there would be a background check. I'm surprised that none of you were told that there would be a background check. I guess in the boards mind is that they want to make sure that the applicant displays honesty and integrity before they will grant them a license. I'm not saying that those who were denied don't deserve a license but a DUI is a serious offense and someone could have gotten seriously hurt or maybe even killed. In the boards mind they are probably thinking who knows they may have only gotten caught once or twice, but is this a regular habit of the applicant? The BON has a lot of things to consider before they license anyone. I'm the first to admit that we are all human and we all make mistakes and we learn from them. But, I'm also someone who lost a family member due to someone driving under the influence that survived. So I see this a little bit differently than most people do. Best wishes and good luck to you all who are having this issue. From Michigan to SanDiego.. HELP! The area where Scripps is located is VERY EXPENSIVE! For what they're paying nurses there I don't understand how anybody can afford to live there on that salary. I make more as a LVN up in the Bay Area than a RN does does in San Diego. Isn't that pitiful? Right now moving to CA isn't a hot idea as you would find it easier and less expensive to move somewhere in South Texas where I heard and read that they are hiring new grads. Get your feet wet first before making a huge move to CA as it might be beneficial at this time. Whatever you decide, I wish you the best of luck! This is an interesting thread as I've read that many people are completing 2 exams a month. How do you do it? Are you basically studying 48 hours a day? Thank you for clarification because i understood differently. I had thought you meant that the LVN clinical hours wouldn't count for the RN licensure if completing a RN program in CA. But I see what you're saying and it does make sense. If Excelsior would just include clinical hours for those states that do require additional clinical hours. From my understanding when I spoke with someone from Excelsior months ago. You can gain licensure through Oklahoma after completing two 30 hour preceptorship in both ob & psych. You will also gain 2 units of credit towards that and it will show up on your college transcripts. But you would have to complete them in Oklahoma. That clinical component is also arranged through Excelsior College and it's completed before graduation. For Arizona which requires 120 hours of preceptorship, you aren't awarded any units, but it does show up on your Excelsior transcripts. That can be done before or after graduation. I'm unsure about Colorado and Washington, but I do know that they require preceptorships also. Sometimes I feel I'm wasting time twiddling my thumbs hoping and praying a LVN-RN program accepts me. I get sooooo tempted to just go through with the program and complete one of the preceptorships and attempt to at least endorse into CA. But then I'm afraid at the sametime because if I'm not accepted then I'm @$$ed out because no CA school would accept me to complete their program because I would have already completed another RN program. It's a catch 22, but if I'm successful then I would be able to help others who are in a similar situation. But we will wait and see. MsPC what are your plans? I know you had mentioned that you'll be moving to another state or something like that. Or did I confuse you with someone else. While you're waiting you may want to brush up on your English skills. Not only is verbal communication important, but also written documentation. Good Luck in your search. Friends cheating.. what to do? They must be back logged with endorsement applications along with new applicants. There are fewer workers and more paperwork to deal with. Sad situation in CA altogether. I'm sorry if you feel that I'm offending you as that's not what I'm meaning to do. It's a good thing that you're reading the regulations because you can get a clearer picture of how things work. But sometimes I feel the regulations are so confusing that you need someone to interpret them for you. Here in CA, most of the LVN programs run about 3 semesters long and have over 900 hours of clinical experience. Which that exceeds the RN program here in CA, but the LVN-RN student still needs to complete the last 2 semesters of the RN program which includes around 300-400 hours of clinical experience. So in the end, the LVN would have completed about 1200 hours of clinical experience between both the LVN & RN programs. Thank you for the information that you have provided because I definately learned something new. That's what I love about this site is because I learn so many new things from the people that post here. Actually clinical hours for a LVN program do count towards the clinical in concurrent with theory. For the LVN program in CA we had to have over 900 hours of clinical time. But I don't think someone who graduates from Excelsior would be able to count those 900 hours fully. You can have 1500 hours of clinical experience in a LVN program, but if there's no psychiatric rotation then it must be met with actual clinical experience. For the LVN program part of the clinical time is met, but you have to have your psych rotation for the RN program. This happened just recently? I heard from a good friend who was in contact with the BRN in CA and was told by them that they were no longer going to let Excelsior graduates endorse into CA around the beginning of the year. I even contact the BRN a few months ago and sure enough it was confirmed. If this happened just recently then that's a great thing. You should ask your friend from GA come and share her experience with the endorsement process as it gives hope for those who are trying to make it. Everyones situation is different and there could be valid reasons why your friend is the exception. She may have education that exceeds the minimum qualifications and that could be the reason why. Thanks for sharing.